Combine 2 oz. 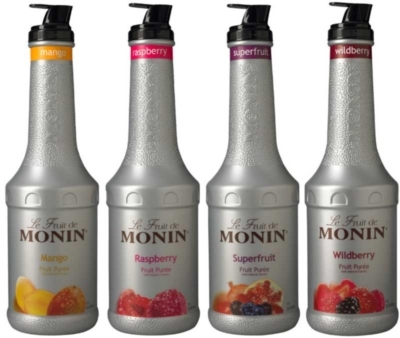 Monin SuperFruit Puree with 5 oz. plain yogurt, and 2 cups ice in a blender. Whisk together 1/4 cup Monin Raspberry Puree, 1/4 cup Sherry Vinegar, 2 1/2 tablespoons minced shallot, 1 1/2 tablespoons chopped tarragon, and 1/2 cup Olive Oil. Native to Southern Asia, the Mango is known as the "apple of the tropics" because of how common it is to most tropical and sub-tropical regions. The sweet and succulent flavor is now enjoyed and beloved throughout the world. Your nose will welcome the authentic and tropical aroma of fresh Mango, matched in flavor and texture with real Mango pulp in a sunny orange color! Garnish with fresh mango slices, other tropical fruits, and/or whipped cream; this fruit puree blends well with banana, coconut, citrus flavors, and strawberries. Raspberries come in rich shades of red, though Roman legend says that they were once white; stained red by the drop of a nymphs blood as she picked fruit for the baby Jupiter (Zeus). Their vibrant color, natural or the result of a mystical injury, carries into the decadent red color of this puree. A true raspberry aroma, sweet and freshly tart, that delivers fully with flavor and a raspberry seeds and pulp for a real fruit texture. Pairs deliciously with other berries, many fruit juices, and mind. Garnish with fresh raspberries, mint sprigs, and/or whipped cream. 'Superfruits', like Blueberry, Pomegranate, Goji Berry and A�a� are rich in antioxidants; compounds found largely in fruits & veggies and thought to play a major role in promoting health, well-being as they combat the free radicals responsible for aging our bodies' cells. With an ORAC (Oxygen Radical Absorbance Capacity) count of 1000 TE (the unit of measurement for ORAC,) which is within the recommended daily intake, in one serving! A fruity bouquet with a strong blueberry aroma; lightly sweet and tart berry flavors complemented by notes of pomegranate and A�a� (plum-like flavor) with a rich, dark purple color. Garnish with lime or lemon wedges, berries, and/or whipped cream and blends deliciously with most berry and refreshing citrus flavors. A delicious blend of Strawberry, Raspberry, and Blackberry provides a vibrant and tartly sweet burst of flavor like eating handfuls of freshly picked wild berries in a field! The dark purple color boasts of the berry flavor before it even hits your lips, and the Black Raspberry/Cherry like aroma will have your mouth watering in anticipation. Garnish with fresh berries and/or whipped cream.